This seafood dish is baked prawns stuffed with its own prawn meat, vegetables, cream of mushroom soup, white wine and spices filling. Then sprinkled with grated cheese and pimiento. 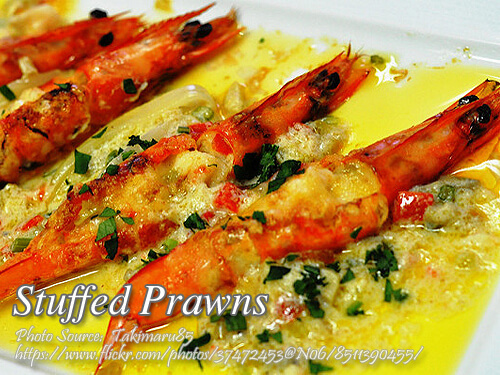 Great way to cook your prawns if your are want to cook a special lunch or dinner on a special occasion. To cook stuffed prawns; Boil prawns and slice the back, leaving the heads and tails intact. Remove the meat and cut into small cubes. Add mushroom, salt and pepper. Sprinkle with lemon juice and white wine. Mix thoroughly and set aside for 10-15 minutes. In medium heat, melt butter and saute garlic and onions. Add the prawn mixture. Cover and allow to simmer. Do not overcook. Add pimiento. Remove from fire and add some of the cream of mushroom soup. Stuff-the prawn shells with the prawn mixture. Sprinkle grated cheese on top. Arrange the stuffed prawns in oven proof platter. Pour the remaining cream of mushroom at the sides. Garnish, top with pimiento slices and dot with butter. Bake in preheated oven at 350°F for 15 minutes. To see complete recipe, continue reading. Boil prawns and slice the back, leaving the heads and tails intact. Remove the meat and cut into small cubes. Add mushroom, salt and pepper. Sprinkle with lemon juice and white wine. Mix thoroughly and set aside for 10-15 minutes. In medium heat, melt butter and saute garlic and onions. Add the prawn mixture. Cover and allow to simmer. Do not overcook. Add pimiento. Remove from fire and add some of the cream of mushroom soup. Stuff-the prawn shells with the prawn mixture. Sprinkle grated cheese on top. Arrange the stuffed prawns in oven proof platter. Pour the remaining cream of mushroom at the sides. Garnish, top with pimiento slices and dot with butter. Bake in preheated oven at 350°F for 15 minutes. Serve hot.